Orcadia & Other Stories, on display at the Pier Arts Centre until 23 August, is a major exhibition of work by Zoë Walker & Neil Bromwich spanning more than 15 years of production including the formative Dream Cloud, created as part of a residency in Orkney in 1997. Zoë Walker & Neil Bromwich are internationally renowned for their large-scale participatory events and exhibitions that invite audiences to imagine better worlds. As part of the project the artists are developing a new sculptural/performance work to be launched during Stromness Shopping Week. 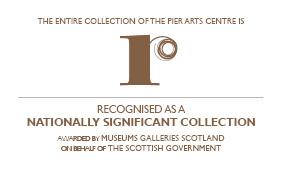 The Pier Arts Centre are looking for people to work with them towards the development of the project. A meeting will be held with the artists on Thursday 10 July 7pm at the gallery and an invitation is extended to all with an interest in becoming involved. There will be opportunities to work closely with the artists on creating sculptural work in a variety of ways including making costumes, practical construction and painting, as well as taking part in the final performance.